House of Stainless has been providing quality stainless steel products to the architectural and interior design industry for over 10 years. 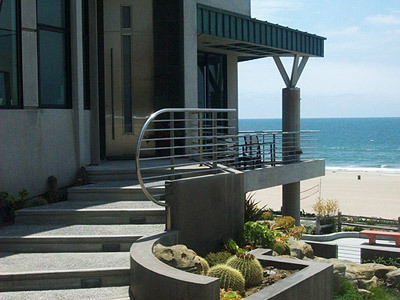 Handrails, gates, and kitchen accessories are just some of the products we create for that client who seeks the ultimate in durability and cutting edge design. We offer three types of finishing for our products: brushed, polished and swirl. If you have a project that you would like to have custom fabricated, please send or fax your drawings and measurements to the address listed on the contact us page. If you live in the area, you may bring your information to our office. We have full portfolio of our work for you to look at. After reviewing your project information, a representative from our office will contact you within an estimated quote and completion time. If you are interested in any of the products in our website, please contact our office. House of Stainless provides many types of custom fabricated stainless steel products for your kitchen, bathroom, bedroom, and other living areas throughout your home. We also fabricate stainless steel accessories for the exterior of your home or business. Some of the stainless steel item we custom fabricate are listed below.